Do you like Mommy's Laundry Day? Share it with your friends. 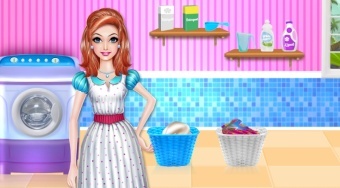 Mommy's Laundry Day is a great girl flash game in which your task will be to help a beautiful mother with a great cleaning of her household. First clean up a big mess in her bedroom. When the room is beautifully shiny, waiting for you to wash your dirty clothes. The last step is to iron out the washed and dry clothes perfectly and put it in place in the closet.